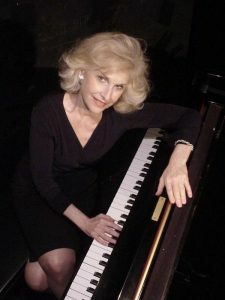 Lenore Raphael, is an internationally renowned jazz Pianist, Steinway artist, radio host and jazz teacher and has been critically acclaimed as one of the best pianists in the jazz mainstream today. Lenore has recorded 10 critically acclaimed CDs on the Swingin’ Fox Music label. Some of her recordings have reached Top 10 airplay and her 2006 recording “Invitation” and 2012 recording “Loverly” were up for Grammy nominations. Lenore now has her own radio show called “Lenore Raphael’s JazzSpot” on purejazzradio and other stations on the internet where she interviews and performs with famed jazz artists and up and coming ones as well. Along the way she has performed and recorded with such greats as Clark Terry, Warren Vache, Howard Alden, Harry Allen, Bucky Pizzarelli, Jack Wilkins and more. Originally from Philadelphia, Doug MacDonald began his guitar career in Hawaii and has played with Joe Williams, Carl Fontana, Jack Montrose, Carson Smith, Jack Sheldon, Bob Cooper, Ross Tompkins, Ray Brown, Buddy Rich, and Ray Charles. Doug also began recording and performing with his own trio and quartet, as well as his 13-piece ensemble, The Jazz Coalition. Doug has released 12 recordings.